If you have an older traditional masonry fireplace, you are not heating your home as efficiently as you could be. Most of the heat created by one of these older fireplaces ends up going out of your home through the chimney. This not only is a very inefficient way to heat a home, but it can also cause your heating costs to be expensive. Bart Fireside can help you heat your home more efficiently and economically by updating your old masonry fireplace with a new energy efficient appliance. We would like to tell you more about the options we have for you that will increase the heating efficiency of your home and reduce your heating costs each winter. 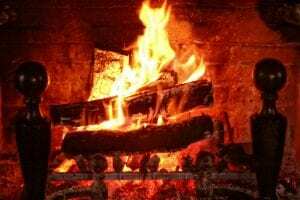 Just because your old wood-burning masonry fireplace is not very energy efficient, it does not mean that you will never be able to burn wood efficiently. Bart Fireside carries several high-efficiency wood-burning fireplaces, including the Fireplace Extraordinair and the Lennox Montecito, Montecito Estate, and Villa Vista. All of these fireplaces have efficiency ratings of 72 percent and have been certified by the US Environmental Protection Agency (EPA) as clean-burning and environmentally responsible heating appliances. These fireplaces have been designed using newer wood-burning technology to pull in air from outside for combustion and circulate heated air around the firebox to provide as much heat as possible, according to HouseLogic. You will also find wood stove inserts at Bart Fireside that our certified installers can slide into your masonry fireplace opening. These inserts are also manufactured with the new technology that allows wood to burn more efficiently. If you love the sensory experience of a wood fire, you can still enjoy the smells, sights, and sounds of a wood fire without sacrificing heating efficiency. Bart Fireside has several different energy efficient gas heating appliance options if you would like to switch to this fuel type. One of these options, direct-vent gas fireplaces have energy efficiency ratings of up to 77 percent. These fireplaces use two-way vents that provide outdoors air for combustion. We also sell and install vent-free gas fireplaces that have amazingly high energy efficiency ratings up to 99 percent. You do not even have to have a chimney for this type of fireplace, so you can install it anywhere you need supplemental heat in your home. However, you should never have a vent-free fireplace in a confined space, and you need to have carbon monoxide detector alarms installed in your home because there is a higher risk of a carbon monoxide leak into your home. We also carry gas fireplace inserts and gas log sets that will heat your home much more efficiently than your old masonry fireplace. Considering upgrading your old fireplace to a more energy efficient heating appliance? Contact us at Bart Fireside to learn more about all of the options we have to improve your home’s heating efficiency and to reduce your heating costs during the winter.